And that raps up the first leg of this series. While working on this I was thinking about the imagination, and how the images are a manifestation of the unmanifested. It’s a reaching into the bag of imagination, grasping onto something, and pulling it out to share. This sort of art would suffice as evidence for alien civilizations that, indeed, human being possess imagination. The title is ambivalent. Is a human hallucinating dolphins, or are dolphins hallucinating? Either way, the image is presented as a hallucination. The main thing I was trying to achieve here is just the quality of another or outside perceptual dimension. It occupies a psychological or conscious space of its own. The style is a mix of a few of the styles I’ve used or come up with during this series. I’d already invented the digital impasto technique, and just applied it here, integrating it with some new techniques. I think some people will see something like this and recognize right away that it’s not quite like anything else, and if I hadn’t make it, this particular vibe wouldn’t exist. Most will look at it and say it reminds them of this or that, but is not quite this or that, and hence falls short of being this or that. I would want people to notice that it’s three dimensional, and impasto, and that that’s been done digitally. The illusion of painting is one level of the illusions. It also is a little abstract and the conspicuous composition (the visual music of arrangement of line, color, form, shape) emphasizes the flat picture plane. You know it’s flat, but it really pops out. There’s more. That demon’s head is lit, and I thought the treatment of concentric circles for his mouth was a little abstract, but works, and is strange. So, yeah, this image is “strange”, and some people will see it, and some people it will fall flat for. I think the value of the imagination, skill at rendering, and painting in general have been sidelined in art as passe or irrelevant. Well, no, that’s wrong, because if you like imaginative paintings that a rendered beautifully, what are you supposed to do, go look at Duchamp’s urinal on a pedestal? Enough for now. I feel like 15 images is a good statement, and now I’m going to pause and do a post about the series, and a video as well. Because I make virtually nothing off of art, have no gallery, and only a small but select audience, yeah, I have to try to do some promo. I’m planning to take a few days to make the video and post. Same time I use to make one of these images. Come back in a few days to see it. Here’s all 15 pieces in the series so far in a slideshow. 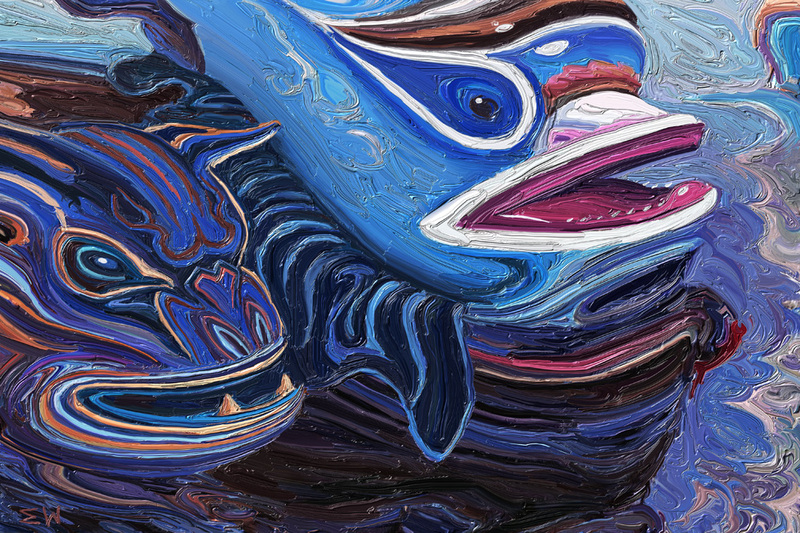 Posted in art, New Series: Imagine ThatTagged art, contemporary art, digital painting, dolphin, Expressionism, painting, SurrealismBookmark the permalink. A strong finish to the series. Really like this one, too. From when I first saw you working on this one I thought it looked like a Native American totem pole image and it still has that quality. As always, I love the colors you chose and how you challenge the viewer to see something that may or may not be there. Cheers. Part one of the series. It’s hard to hold back and do a post and video, when I really feel like just moving on to the next image. Great break point – looking forward to the next ones. Thanks, man. I’ve been taking a few days off and watching a bunch of movies. Will switch back into gear very soon.